Win The Mummy: Tom Cruise battles an ancient evil | SWITCH. Tom Cruise confronts a legendary terror in an all-new stunning thrill ride, The Mummy. This spectacular saga sees an ancient evil unleashed after centuries of captivity as her lust for revenge threatens to destroy the world. Cruise battles this ultimate evil as U.S. military solider of fortune Nick Morton in a breath-taking version of the legendary and mystical monster that has captivated and terrified humankind for centuries. Thought safely entombed deep beneath the desert, an ancient princess (Sofia Boutella, 'Star Trek Beyond', 'Kingsman: The Secret Service') whose destiny was unjustly taken from her is awakened in our current day. Her malevolence has grown over millennia and with it come terrors that defy human comprehension. From the sands of the Middle East through modern-day London, The Mummy balances wonder, thrills and imagination. The 'The Mummy' competition has now closed. Winners will be announced shortly. Competition opens at 5pm AEST on Sunday 3rd September 2017 and closes at 11:59pm AEST on Sunday 10th September 2017. Five winners will be chosen at random on Monday 11th September 2017. To successfully win, entrants must fulfil the above entry conditions before the time the competition closes. Current members/followers are eligible to enter the competition. Only one entry per person. Only one winner per household. To be a valid winner, the entrant must not have won a prize from SWITCH within the last 28 days. Each winner will receive one Blu-ray copy of 'The Mummy'. By entering, you agree to receive occasional emails from SWITCH in the future. If you decide to unsubscribe from these updates, any further entries will not be applicable. Only Australian residents are eligible to enter. 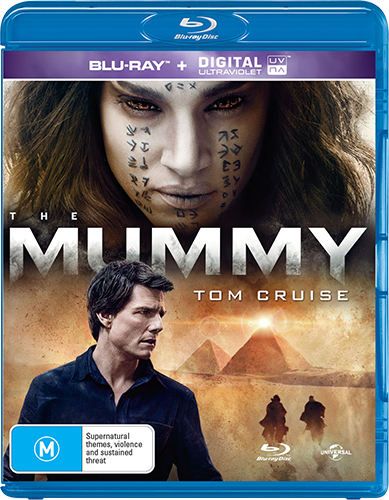 'The Mummy' is available on 3D Blu-ray, 4K Ultra HD, Blu-ray, Digital and DVD on Wednesday the 6th September 2017 from Universal Sony.